Teen Titans Go! to the Movies is absolutely nothing like the TV show, and that is truly a good thing. 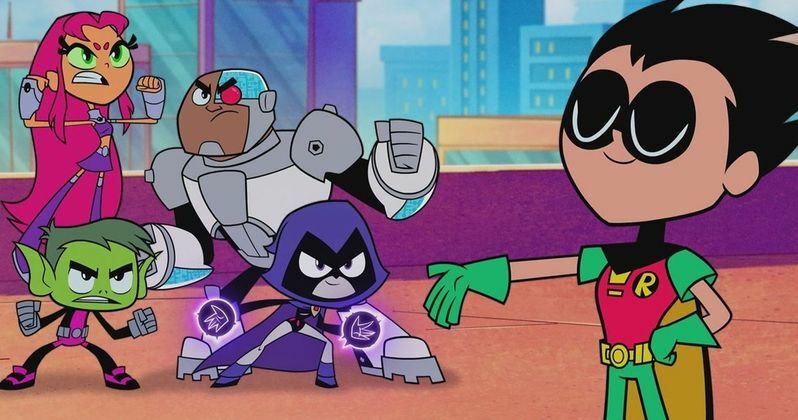 While most people expected the Teen Titans Go! movie to be an absolutely appalling heap of garbage, it ended up being a surprisingly good time, filled with enough hilarious parodic elements to make it stand out from every other superhero movie on the market. The series Teen Titans Go! tries desperately to be satire, but falls short with nearly every episode. It is one of those shows that has given Cartoon Network a bad reputation, being filled with campy, over the top nonsense, leaving millions of Teen Titans fans disappointed. However, unlike the show, Teen Titans Go! To the Movies succeeds phenomenally in being a satire, making itself a truly worthwhile trip to the theater. One of the best parts about Teen Titans Go! To the Movies is how current their jokes' source material is. The movie makes jokes about a number of recent movies, and even stuff that hasn't come out yet. For example, one of the major plot points of the movie is a streaming service being developed that will feature all of the superhero movies of that universe in one place, and that the Teen Titans / Robin movie they make during the movie will be the first release that they will stream. This is directly correlated to "DC Universe," the Netflix-like streaming service featuring only DC movies and shows that launches next month. Just like in the movie, one of the biggest features for DC Universe will be the live action Titans series that will release shortly after the service launches. The movie also parodies how many superhero movies are currently being released, making jabs both at themselves and at Marvel. Marvel properties like Guardians of the Galaxy and Deadpool are name-dropped early on in the movie, in addition to a number of DC movies, both good and bad. It even made references to other, non-superhero movies at times, with an entire scene playing homage to Back to the Future. Throughout the course of the movie, the characters and story constantly poke at the fact that there are way too many superhero movies currently being made in some truly clever ways. The humor of the movie was all over the place, ranging anywhere from wall-breaking jokes to absolutely dark jokes that truly shocked the audience. While the movie did resort to a couple of fart jokes throughout the duration of the movie, it felt like the writers really limited themselves to the number of those jokes that they would make, which I can assure you was a good thing. After the first fart joke that occurred in the first five minutes of the movie, which lasted a good 30 seconds, the writers probably could have moved on and not included any more. While they still included a couple more fart jokes after this point, there weren't really enough to ruin the entire movie-going experience. All things considered, it is nice to see that the Teen Titans Go! writers finally found a happy medium with their fart jokes and found even more clever ways to make the audience laugh. Teen Titans Go! To the Movies is undoubtedly better than nearly every other DC movie released by Warner Bros. Pictures over the past couple years. It is a fantastic parody, on the same level as Deadpool and The LEGO Batman Movie. While this movie seems like one that is easy to skip at the theater, it is surely a worthwhile popcorn flick, especially if you have kids. The different styles of humor, the shocking cameos, and the numerous references helped make Teen Titans Go! To the Movies a surprisingly entertaining experience.